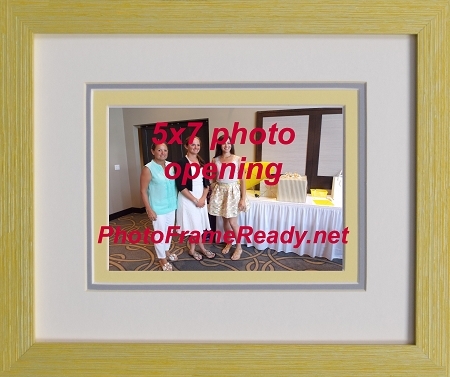 Yellow textured wood picture frame overall size 11-1/2 x 10-1/2 has a 5x7 photo, certificate or diploma opening. Triple matting has beveled edges, white, Grey and yellow triple mat with 1/2 inch revel on bottom mat. Solid wood textured moulding with a glass front, mounting boards and wall mount hanging system. Unit hangs both horizontal or vertical.